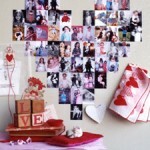 30 Days of Valentine’s Fun Day #1: Valentine’s Day Countdown! 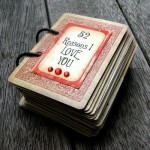 You are here: Home / Uncategorized / 30 Days of Valentine’s Fun Day #1: Valentine’s Day Countdown! 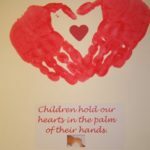 I’m not a huge fan of Valentine’s Day itself because I feel that it’s a bit over-rated and that you should show and tell the people in your life that you love them all year, but I DO love all of the fun Valentine’s Day crafts and recipes and so I’ll be bringing you 30 Days of Valentine’s Fun! 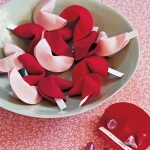 You’ll find new recipes, ideas for making your own Valentines, crafts, and more! My kids and I have already started! I found today’s “share” on Pinterest, which is quickly becoming my new favorite form of entertainment! It’s a Valentine’s Day Countdown from Infarrantly Creative! To be honest, this is a bit “involved” for me, but I love the concept, so I am going to find a way to adapt this! I can’t wait! 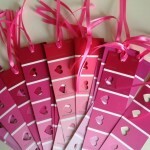 30 Days of Valentine’s Fun Day #2: Paint sample bookmarks! I am glad you liked my idea and I can’t wait to see your take on it.